Do you want to download a webpage or website for easy offline browsing? SiteSucker does this automatically on your Mac computer. 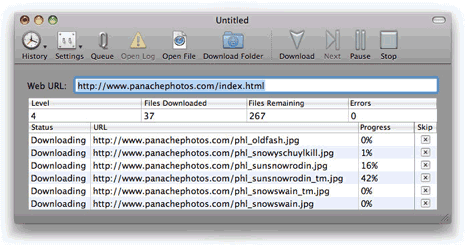 It asynchronously copies webpages, images, backgrounds, media and other files on your local hard drive. To get started, just enter the URL web address of website or webpage you want to download. SiteSucker app will make local copy of the specified URL complete with text and images content. You can even pause the download process and resume it as and when you want. You need good internet connection to download files quickly. SiteSucker is a free application for MAC computers powered by Mac OS X 10.4.x Tiger or above. Try the download frenzy, MAC users!